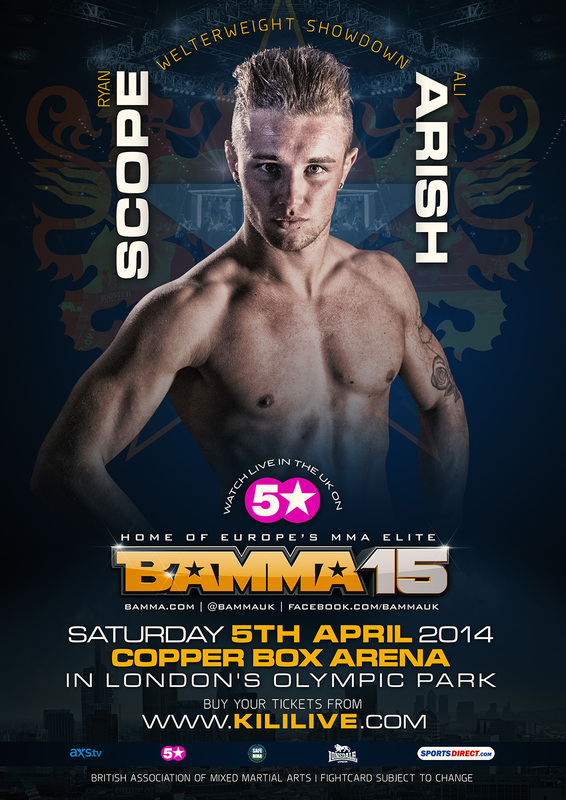 March 10th, 2014 – Europe’s flagship Mixed Martial Arts promotion, BAMMA, is proud to announce another Welterweight bout to the BAMMA 15 card, as Ryan Scope faces Ali Arish. Undefeated poster boy, Ryan ‘Big Baby’ Scope, made his BAMMA debut at BAMMA 12 in Newcastle where he usurped unbeaten favourite, Luke Newman, via first round Triangle Choke. The fight card, hampered by injuries, saw a late reshuffle which pushed the Scope vs. Newman fight onto the 5* televised main card and the Channel 5 highlights. The Sunderland native competed in his first MMA fight at the age of 17 and went on to attain an Amateur record of 8-2-0, before moving up to professional MMA to earn a current record of 8-0-0. Scope has achieved 3 wins via TKO (Punches), 4 by Rear-Naked Choke and 1 via Decision. He has nailed 6 of his professional victories in the first round. Currently training with Colin ‘The Freakshow’ Fletcher, Phil De Fries and Ross ‘The Real Deal’ Pearson, Scope is a regular at the Alliance Training Center in San Diego; and is touted as one of the UK’s most talented upcoming fighters. His most recent outing was at Newcastle’s Made 4 the Cage in February, where he scored a 1:45 victory over Phil Flynn via TKO. Iranian born and Manchester based, Ali Arish competes out of Moss Side GnP and is currently ranked at number 4 in the UK and Ireland. Arish possesses a professional MMA record of 20-2-0, with 9 victories attained in the 1st round via KO, TKO and Submission; and 10 via Decision (9 Unanimous). Among these he holds a KO victory over BAMMA Lonsdale British Welterweight champion, Wayne Murrie. Arish was pitted for rematch against Murrie at BAMMA 12 but was forced to withdraw from the fight due to injury. Arish is coming off a unanimous decision win over Jack Mason.